Do you suffer from gut problems, bad skin, or obesity? Then, you may want to try drinking lemon water first thing in the morning. Lemon water is an inexpensive and nutrient-rich drink that can be prepared quickly at home. When you drink it on an empty stomach in the morning, your digestive system works better, your immunity gets stronger, and your renal system functions properly. So, in short, the humble lemon water may help alleviate some of your health problems. In this article, we’ll tell you how to prepare lemon water, how often to consume it, and what are its various benefits. Sounds great? Let’s begin. When we hear about the benefits of drinking lemon water, it is obvious to wonder why one should have lemon water in particular and not the juice of some other fruit. Well, lemons are rich in vitamin C, and apart from that, they contain vitamin B complex, minerals like calcium, magnesium, potassium, and also a lot of fiber. In fact, the amount of minerals in it calls for diluting lemon juice with water as drinking it undiluted could harm the enamel of the teeth. So, make sure you drink ‘lemon water’ and not ‘lemon juice’! Lemons have excellent antibacterial, antiviral, and immunity-boosting properties and keep you hydrated, promoting your overall well-being. 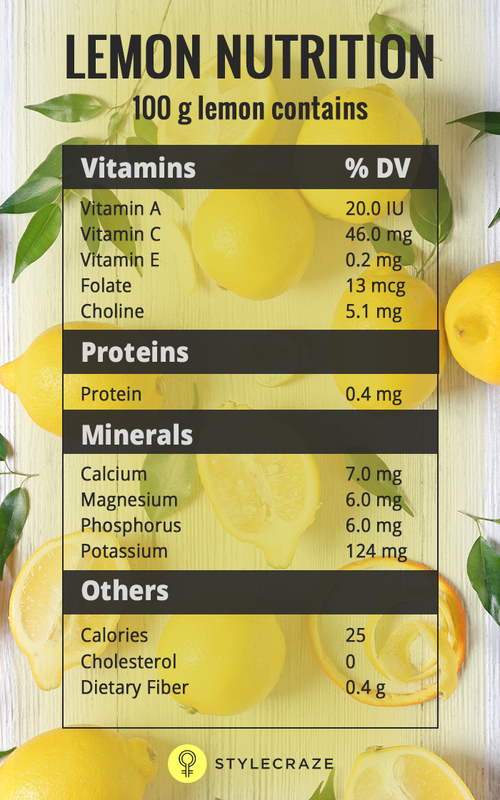 Check out lemon water nutrition facts below. 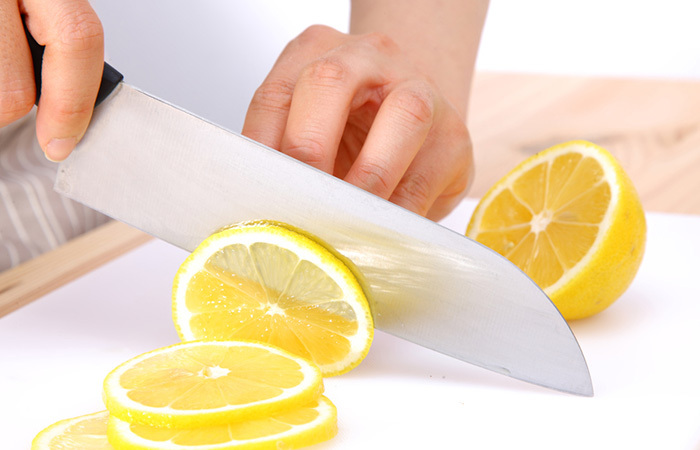 Wash the lemon thoroughly and cut into slices. Add the lemon slices to a pitcher of chilled water. Drink one cup of this water in the morning. 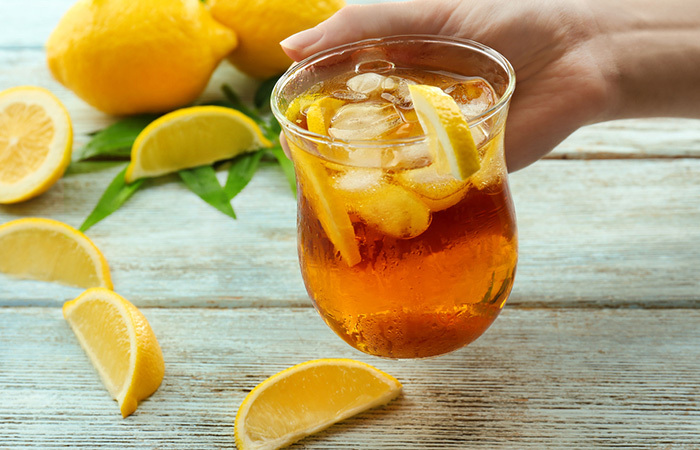 If you get bored of drinking the same lemon water every day, check out these recipes. Add honey and lemon slices to the warm water. Honey is a natural antibacterial agent and prevents spreading of microbial infections (1). However, keep in mind that it is still sugar and should not be consumed on a regular basis. 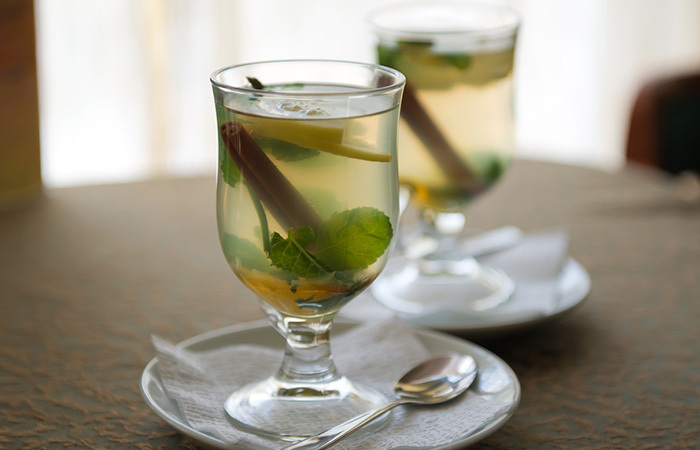 Add cinnamon stick and lemon slices to a cup of water. Drink this water in the morning. 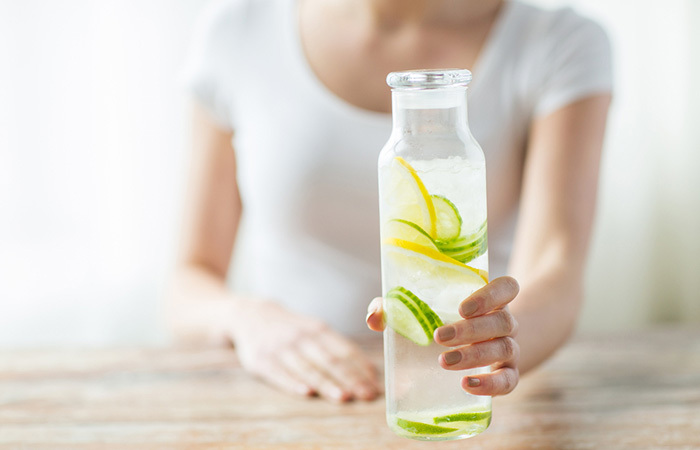 This drink may help flush out the toxins and also aid weight loss (2). Add the lemon slices and cumin powder to a cup of water. Let it steep for 10 minutes before drinking. If you suffer from digestive problems, try drinking this in the morning. Cumin helps tackle all gut problems, including Irritable Bowel Syndrome and bloating (3). Start by drinking one cup of lemon water twice a day. Drink once in the morning and then in the evening before dinner. If you want to drink more than two cups of lemon water in a day, you should drink it after every 2-3 hours. Reduce the frequency of lemon water consumption gradually to once a day. 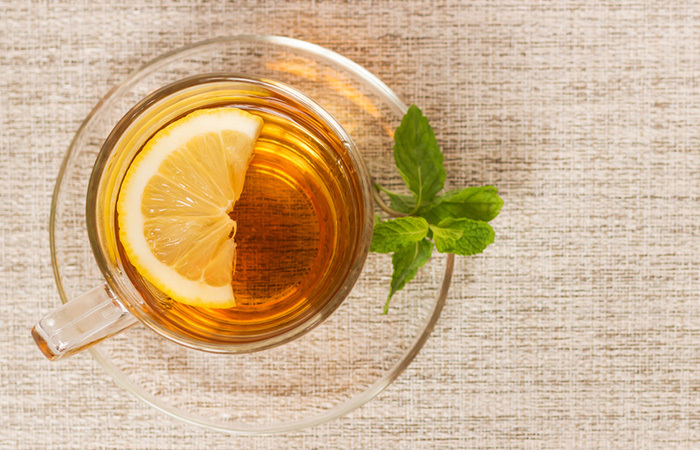 Should You Consume Lemon Water Hot Or Cold? Do not drink it hot as hot water may damage the nutrients present in lemon. But you can have it in warm, chilled, or room temperature water. The benefits of lemon water are innumerable. Here are the reasons you should drink lemon water in the morning. Why Should You Drink Lemon Water In The Morning ? The consumption of lemon water increases the volume of urine, helping in flushing out the toxins that get accumulated inside. This keeps the urinary tract clean and healthy and also boosts the functioning of the enzymes. This property of lemon water makes it a wonderful detoxification agent. The atomic composition of lemon juice is similar to that of the digestive juices in our gastrointestinal tract and the saliva. Hence, it helps in breaking down the food into simpler substances and also encourages the production of bile juice that assists in the digestion process. Simultaneously, the digestive properties of lemon can help in avoiding troubles like bloating, heartburn and belching. 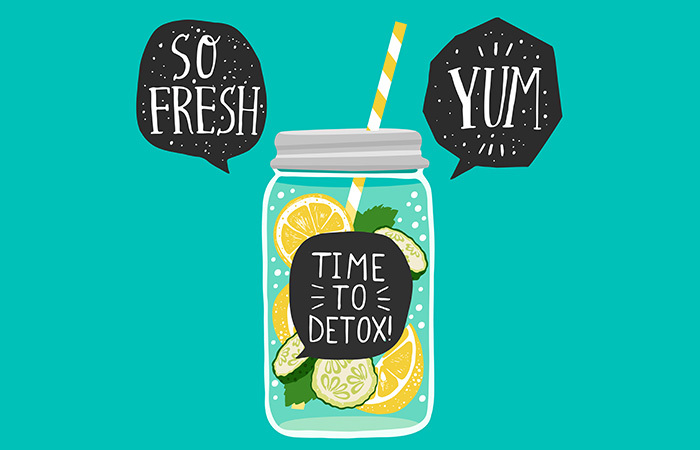 Hence, if you have been experiencing acidity and bloating of late, try lemon water to soothe the sensation instead of consuming any over-the-counter antacids. Though it is acidic, lemon juice has alkaline effect when it reaches inside the body, helping in the metabolic activity. Hence, drinking lemon water on a regular basis can help people combat acidity problems. The high vitamin C content in lemon juice makes it an ideal food for boosting the immunity of an individual. It helps one fight colds And since it is rich in potassium, it stimulates the functioning of brain and nerve cells. The consumption of vitamin C helps in the absorption of iron in the body from other foods. 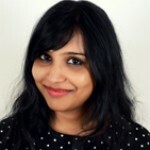 Shun all those cosmetic anti-aging solutions that you are using to make your skin look young. Instead, grab a glass of lemon water every morning! The vitamin C content in lemon juice makes it an incredible antioxidant due to which it helps in the removal of wrinkles and blemishes from the skin and combats the signs of aging. It also helps in overcoming the free radical damage on the skin and makes the skin healthy and glowing. Consuming lemon water regularly hydrates the skin and makes it healthy and rejuvenated from within. In the cases of wounds and injuries, consuming lemon water helps quicken the healing process due to its vitamin C content. It also helps in strengthening of the bones, cartilages, and connective tissues in the body and soothes the inflammation in the body joints and muscles. Drinking lemon water in the morning can charge you up for the entire day. This is because of the negatively charged ions in it that produce energy on reaching the digestive tract. The fluids lost by the body during the daily activity may cause dehydration and fatigue. Lemon water helps in hydration, reduces fatigue, and revs up energy levels. So, drinking lemon water should be the first step to tackle fatigue and dehydration. Lemon water, when consumed after brushing the teeth, can help in the preventing gingivitis and tooth pain. Also, it helps in preventing bad breath. The pectin fiber in lemons helps keep hunger pangs at bay. As a result, one ends up feeling hungry less often, which eventually prevents the consumption of unhealthy snacks at odd hours. Also, drinking lemon water helps in proper digestion and in flushing out the toxins, all of which contribute towards weight loss. Nothing in excess is good for you. Here is what could happen if you go overboard with lemon water. So, try drinking lemon water to achieve optimum health. As the saying goes, if you are healthy on the inside, it will show on the outside on outside.